Wedding cakes are one of those items on a bride and groom's wedding planning checklist that you may think of as non-negotiable. Every wedding has to have a great big, fancy cake in the center of the room for the bride and groom to cut, right? Wrong! If cake isn't a dessert that you particularly care for, it is silly for you to pay for something you don't really want to eat. Wedding cakes don't come cheap. Even if you love cake, maybe you prefer to have a little variety on your dessert table. There is absolutely no rule saying you can't serve something else. A table full of treats gives each guest the ability to choose their own dessert from a table full of possibilities. If you don't want to go the traditional "cake only" route, WhereBridesGo.com has a few tasty alternatives that are sure to be crowd pleasers. Maybe you do love cake, but you want to choose multiple flavors instead of only the one or two that cake layers allow. 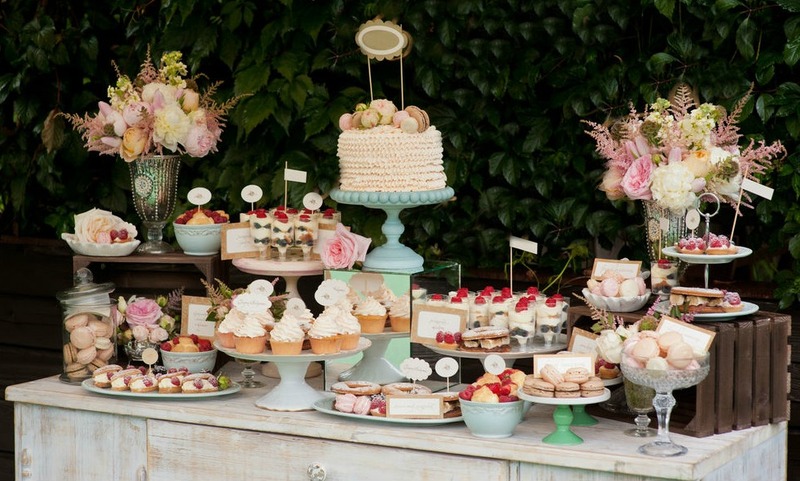 Cupcakes are also a perfect alternative for smaller weddings where a giant cake simply doesn't make sense. Today there are plenty of creative bakers out there that can pack a lot of flavor into one of these tiny little cakes. Coffee shops all over the country feature this popular treat. 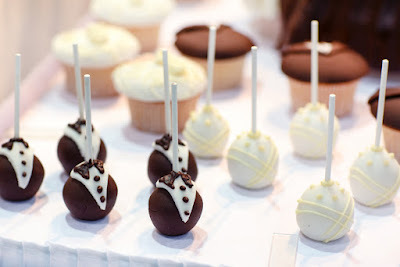 All the taste of cake and icing packed conveniently onto a stick in bite-sized portions. This is another way to be able to offer multiple flavors, and they look adorable arranged on a table. Chocolate is generally a winner when it comes to dessert, and there are a lot of people in the world that may turn their nose up to cake but jump at the chance to eat a moist, chocolaty brownie. Offer a few varities, like rocky road, caramel swirled, cheesecake, red velvet... Your baker should have some creative suggestions for you. Pie is a special treat that you may not expect to see at a wedding. You can go with rich and creamy or hot and fruity, or better yet, offer a few of each. A few basic cheesecakes with a variety of different toppings makes for a beautiful and delicious dessert table. 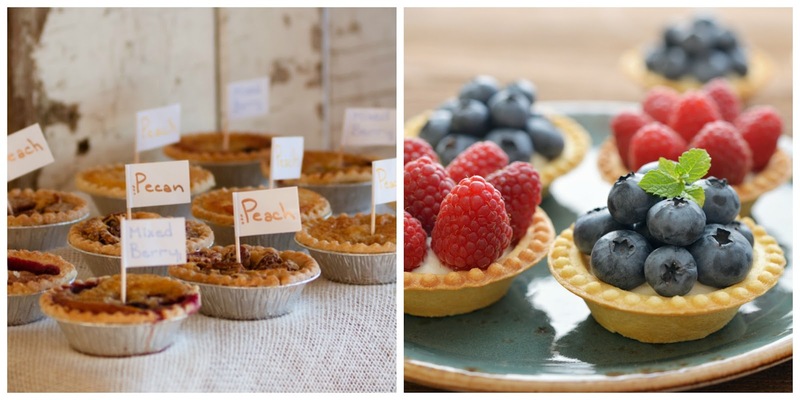 These are both extra-adorable when presented in single-serving, mini pie tins. If you are looking for variety, cookies may be the way to go. A table full of your family's favorite recipes is enough to make anyone's mouth water. Macaroons, chocolate chip, oatmeal raisin, sugar, gingerbread, snickerdoodle... you can even throw in some rice krispies treats if you like those. (And who doesn't?) Be sure that you have some milk close by for this type of table. Kind of like cake, but in a form nearly no one can resist. Make sure to order extra donuts if you decide to do this type of table, because after a night of reception dancing, these make a great late-night snack too. These are single-serving desserts in their own cups. They can resemble a tall shot cup, and we have seen them served in mini martini glasses. 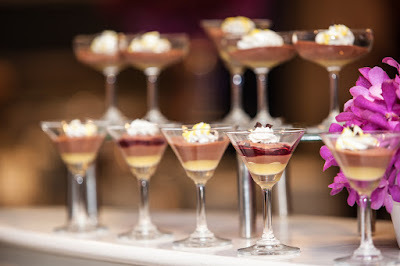 Inside these cups are miniature versions of popular desserts: strawberry shortcake, chocolate mousse, trifle, banana pudding... this list truly is endless. Imagine your very favorite dessert in the entire world, shrink it down, and pop it into a tiny container. These are yummy, they look gorgeous, and are a great favor for guests to pack up and take with them. A popular trend is to fill jars with unwrapped candies in various shades to match the wedding colors. 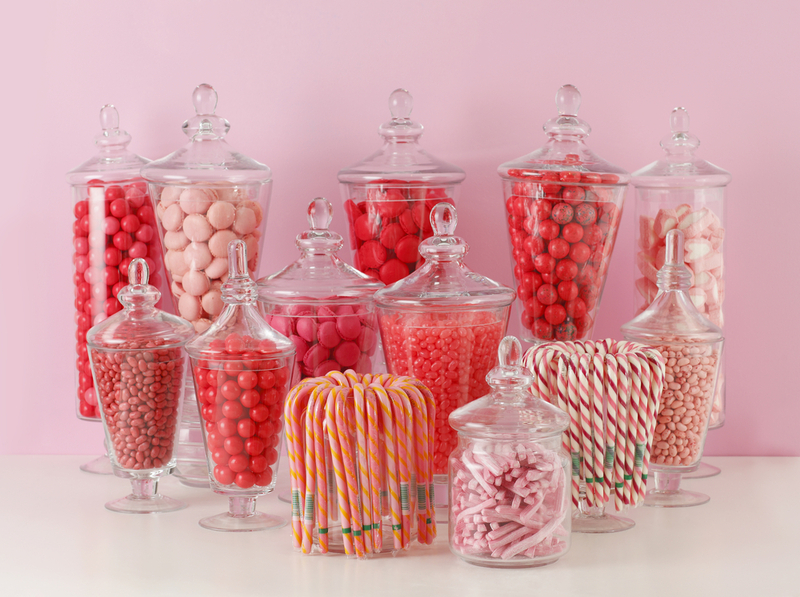 You can also fill bowls with your favorite wrapped candies if you prefer. These are for the desserts that can't necessarily be made ahead of time. Set up stations with toppings and let your guests create their own dessert masterpieces: s'mores, ice cream sundaes, and caramel apples are some great ideas. If you are still a bit of a traditionalist and want to have that cake-cutting moment as bride and groom, add a small cake to the table for this purpose. You can also assemble many of the desserts above into the shape of a cake and cut that. A little imagination can go a long way with this. You can still get your adorable cake topper, even without a cake! Most cake toppers look just as wonderful as a small figurine sitting on the table as they do on top of a wedding cake. They are a great way to inject some of your personality as a couple into the decor or pull your wedding theme over to the dessert table. 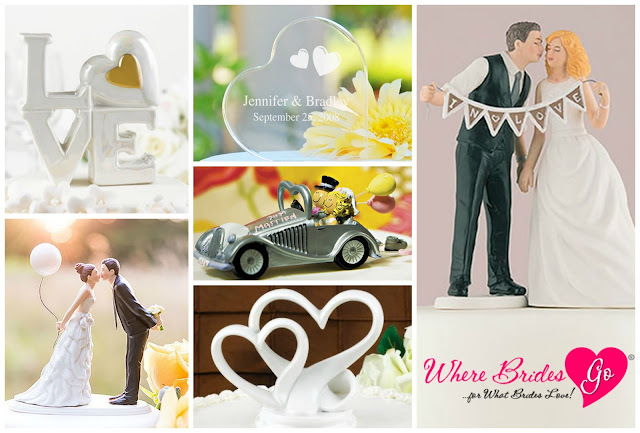 You'll find some of the best wedding cake toppers online in every style at WhereBridesGo.com. Any of these would make a lovely centerpiece on a dessert table. When it comes to the dessert that you will be serving at your wedding, you are only limited to your own imagination. Do what you, as a couple, are the happiest with. If you serve what you love, your guests are most likely going to love it too.